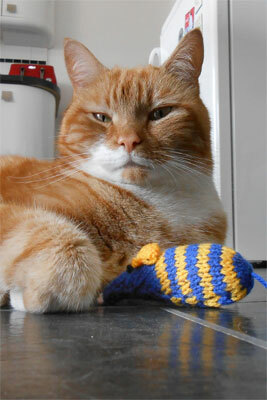 Calling all knitters – toy mice and blankets needed for playful cats! Crafty cat-lovers are being asked to help unwanted cats and kittens this autumn by making cosy blankets and fun mouse toys as part of Cats Protection’s knitting bee. The UK’s largest cat charity is appealing to knitters to help make life a little more comfortable for thousands of cats in its care as they wait to find new homes. Donations can be dropped into any of the charity’s branches, shops or adoption centres or taken to Cats Protection’s stand at the Knitting & Stitching Show at Alexandra Palace in London from 7 – 11 October. A pattern for the popular Captain Cat-Battler knitted mouse – originally designed by Lauren O’Farrell (www.whodunnknit.com) – will be available to pick up at the show, or by calling the charity’s Helpline on 03000 12 12 12. As well as details of the knitting bee, Cats Protection’s stand will be a hive of activity for cat lovers, with cat care guides, a range of cat-related merchandise and information about how to become a volunteer for the charity. Visitors will be able to use an iPad to take a look at the charity’s online Find-a-Cat search tool to see cats and kittens available for homing in their area. “We first launched our knitting bee last year and have been thrilled by the support we’ve received from knitters across the UK. “The finished items have been a great success with the cats in our care, with the mice providing hours of fun and the blankets offering a snug place to curl up on. Cats Protection is the UK’s leading feline welfare charity and helps over 205,000 cats each year through its national network of over 250 volunteer-run branches and 31 adoption centres.